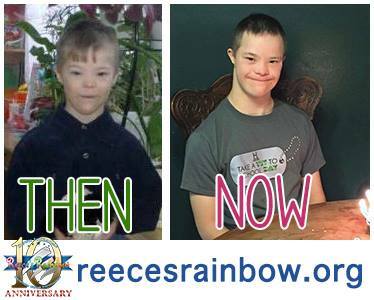 Reece’s Rainbow is dedicated to rescuing orphans abroad with Down syndrome. 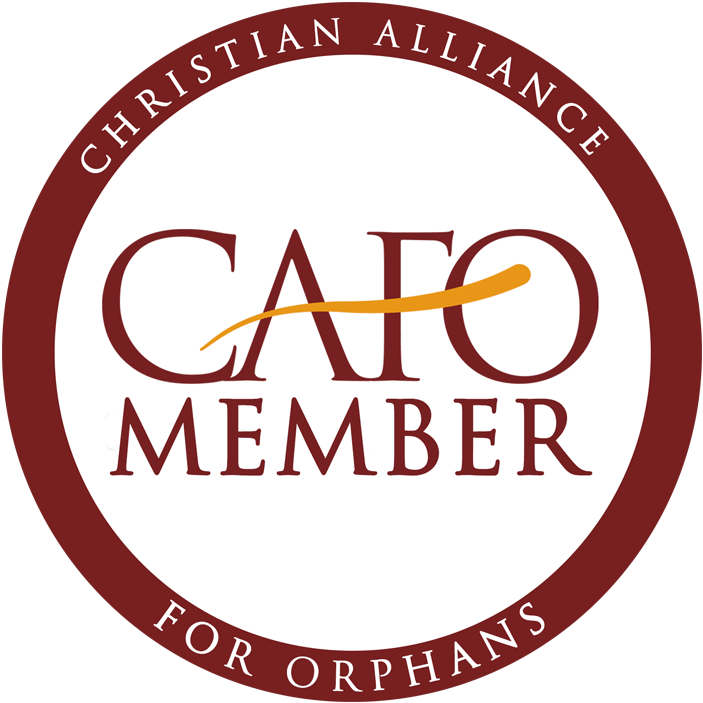 The ugly truth of the matter is that once these children reach a certain age, especially growing up in institutional/orphanage settings, they get to a point where they are no longer likely to be adopted. Darcy is a delightful little girl! She came into care when she was 3 years old. 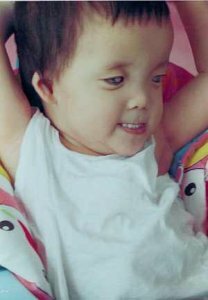 She was diagnosed with Down syndrome, and a CHD (VSD) As of her report, done almost a year ago, she has not received surgery. Darcy has very good gross and fine motor skills! 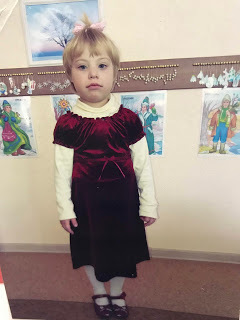 She is able to dress herself, and can walk and run with ease. 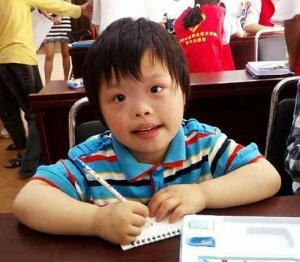 She attends pre-school where she is learning to write. She has good recognition of colors, numbers, shapes, and names of objects. Darcy loves to play sports, and really enjoys her time outdoors! 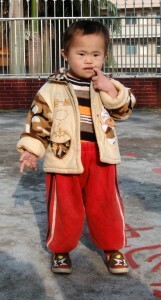 She has adapted to school very well, and plays well with the other kids. Darcy’s receptive speech is good, and they are working on her expressive speech. 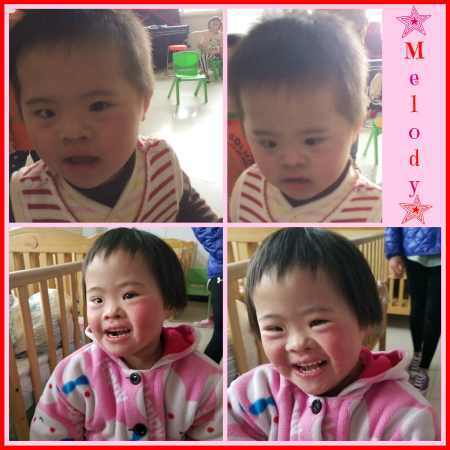 She has had no serious illnesses while at the orphanage. 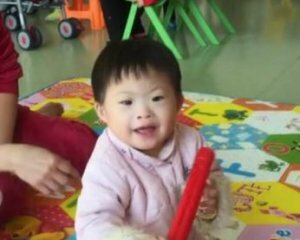 This precious little girl will bring lots of fun and laughter to your house! Darcy is waiting for a family! $2,079.50 has been donated towards the cost of my adoption! 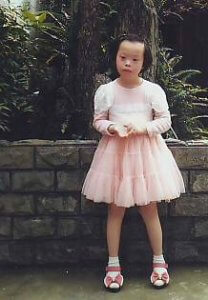 Hanna, age 5, has Down syndrome and was abandoned as a newborn. 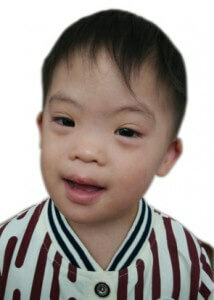 Hanna has a big smile and is described as an active little girl. 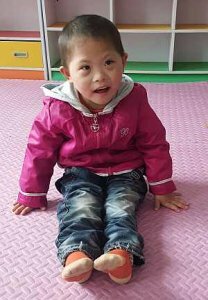 Since being placed with a foster family, she has made progress in her language, physical, cognitive, social and emotional development. Hanna is not a big talker, but she understands and responds to her teacher. She can use the bathroom, get dressed/undressed on her own, throw and chase a ball. Hanna likes to care for other children and comfort them when they are sad. Could this sweet girl be your daughter? Update: 5 year old Hanna is an absolute doll! 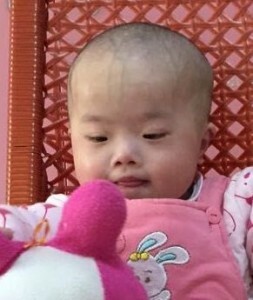 Agency staff were blessed to meet her in China in September of 2015. 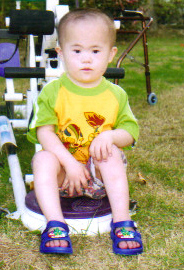 She is in foster care in the orphanage village on the orphanage grounds. 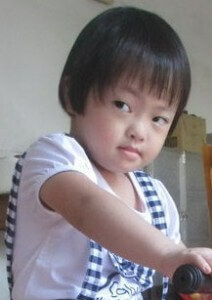 She attends school in the orphanage, where she is in her 2nd year of kindergarten. She likes to play with toys and help put chairs away at school. She is friends with all of the kids in her class. She loves sweet dim sum, crackers, and cakes. Hanna likes playing with the sports equipment, especially balls. She is toilet trained. 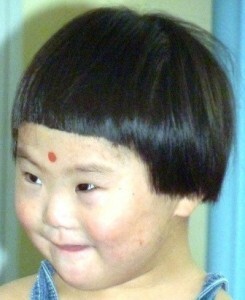 Hanna was sent to the orphanage in 2014. She had a scar on her neck when she came- the orphanage is not sure what it was from. She is super cute, smiley, flexible, and very friendly! She laughed happily and is always excited to see new people. She offers toys to new friends and is good with sharing. She is not at all aggressive. She only makes noises and mimics. She has a couple of simple words, but is not totally clear. 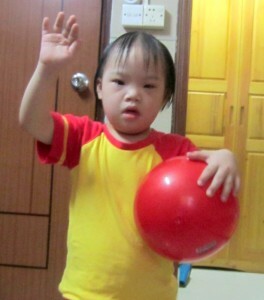 Hanna loves to dance and has good gross motor skills. She has good fine motor skills as well and can string beads. She is independent with her care- she can dress and undress herself and feed herself using a spoon and a cup. 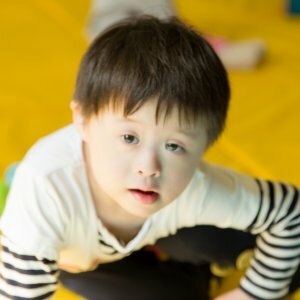 Hanna is high functioning for a child with down syndrome. She is a very happy and loving girl who will bless some lucky family so much! 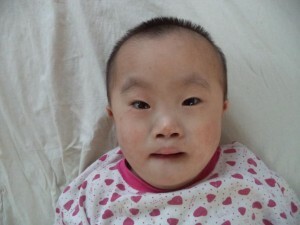 A $5000 grant is available from the agency that currently has her file, to help Hanna get adopted. $1,028.70 has been donated towards the cost of my adoption! Libby is a joy! She is 4 years old, quite a spunky kid, and a born entertainer. 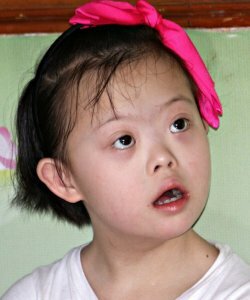 Libby has Down syndrome, with no known heart issues. Her motor development has been good, with some delays in her speech. 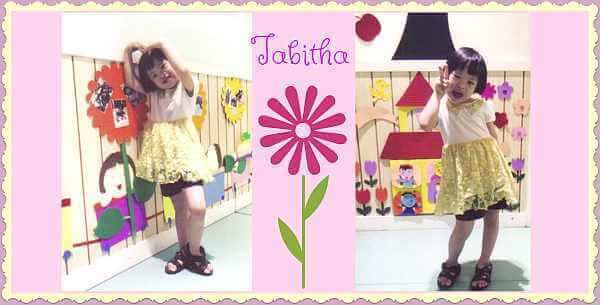 Libby loves music, loves to “sing”, and was born to karaoke! She is social, happy, follows directions well, and is ready to charm her new parents. Libby is waiting! $801.50 has been donated towards the cost of my adoption! Little Halle is a very intelligent child. Now, she attends a little brothers and sisters class in the institute. Normally, she learns how to dance, sing and play games with the teacher. Halle really likes to dance. She is most skilled at the “Little Running Pig” dance. If you play music, she cannot help but to start dancing. And then, with one hand, she will even imitate grabbing a microphone and she will sing and dance. At this time, she will even let other children dance with her. Halle really likes playing outside. She will look at the beautiful flowers and grass in the garden. She will point at them and say: “Nannies, quickly, look!” with an extremely cheerful smile. Little Halle is very well-behaved. Every time she is done eating, she will clear away her bowl and take all of the bowls. Then, she will arrange all the little stools. Everyone all really likes bright, clever and sensible Halle. Please help us find a forever family for Halle! $741.26 has been donated towards the cost of my adoption! 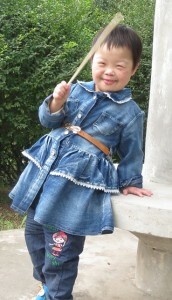 Precious Lina has Down Syndrome and entered the orphanage when she was about 3 years old. She is very timid. When she does not get a toy, she will cry loudly and will cry out, “Mama, it’s mine” to the nannies. When she gets a toy, she will smile at the nannies. When she’s sleeping at night, she will lie down on the bed and wait for the nannies to say, “Lina, we are going to sleep and we are going to turn the lights off, be a good girl!” She will smile and nod her head then close her eyes and go to dreamland. When she feels wronged, she will run to the nannies and say, “Mama, Mama” and the nannies will comfort her and pat her head and say, “Good girl, don’t worry about it.” She will then run over to the children and continue playing. When she sees other little children with a runny nose, she will help them wipe it and then smile at them. $939.72 has been donated towards the cost of my adoption! Meet Lydia! This sweet little one has been in care since she was a baby. She will turn 6 years old in March. 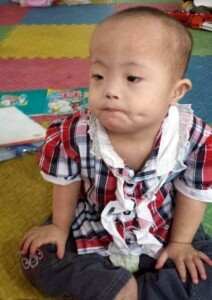 Lydia has Down syndrome, with no known heart issues. While Lydia has had the expected delays, her motor skills are very good. It seems she can really pitch a ball well! Her speech, although initially delayed, is coming along nicely. 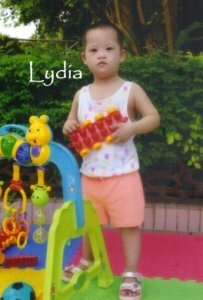 Lydia loves to play with her friends, and really looks forward to giving the nannies a hug! She is well loved by the staff. Lydia needs a family, and the opportunity for a good education so she can reach her full potential. 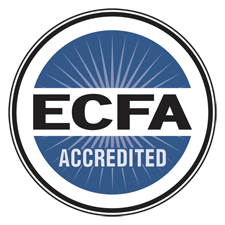 There is an agency grant of $6,000 toward agency fees for a qualified family. Lydia is waiting for you! Down syndrome, Tonsillectomy, adenoidectomy performed in May 2014. 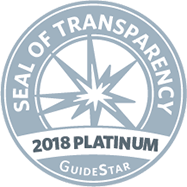 Excellent heart echo, no longer needs follow-up. Structurally normal heart. Normal-sized cardiac chambers. No PAH/COA. Good biventricular systolic function. Update January 2018: Heidi is identifying her ABCs and is able to write her alphabet. With some assistance she is able to write numbers 1 through 10. 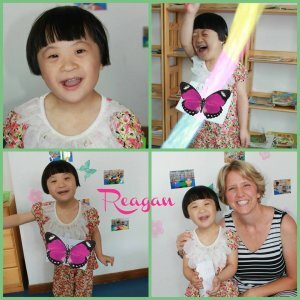 She receives tutoring from in home teachers and participates in other various learning activities at home as well as a special education class every morning at a local institute. Her speech has improved greatly, but she would benefit from speech therapy. She is verbal, but not everything is understood by those who don’t know her well. She speaks in sentences of 3-4 words in both English and Telugu, and can name caregivers and other children in the home. She uses sign language to communicate things like wanting food, water, or the bathroom. She attends the washroom independently. Heidi is observant and reserved when getting to know new people, but she does warm up to people and likes to share with her friends. She is comfortable playing independently and enjoys coloring. She loves to help around the home and can often be found cleaning or helping other kids. She has a wonderful imagination and likes to invite others to join in on her play. Agency staff met Quinn in November 2017 and said she responded to voices and her name, followed moving objects with her eyes and searched for dropped objects. In addition to having a few words she could communicate with gestures to express her wants/needs. She was able to maintain eye contact and was said to be a good sleeper. She was living with a foster family and had a 6 year old foster brother. 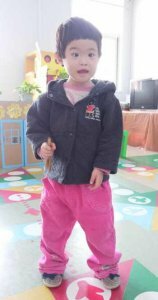 Quinnlee is described as a very active and inquisitive, happy girl. 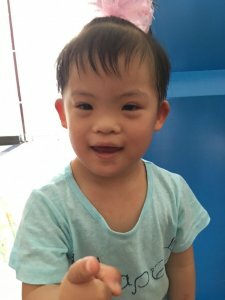 There is a $5,000 agency grant for Quinn’s adoption with her current agency! $15,004.50 has been donated towards the cost of my adoption! Magnolia was born in July 2012 and found abandoned when she was around 13 months old. 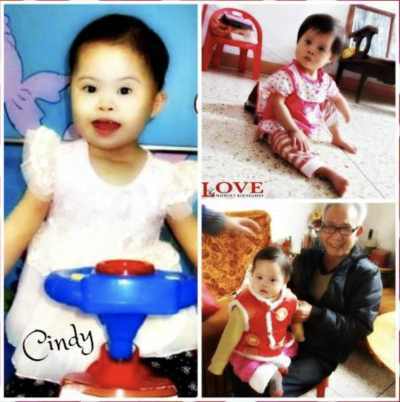 She has been diagnosed with Down Syndrome and post-operative congenital heart disease (VSD). A color ultrasound of her heart is available with her adoption file. Magnolia can run, jump, walk backwards and forward, and climb stairs up and down. She can throw, catch and kick a ball. Her hands can move freely and are flexible. She can eat with chopsticks and spoons, and drink with a cup. She can paint and enjoys reading picture books. She loves to play with blocks, listen to music and watch cartoons. She can understand some words and use simple communication to express her needs. She knows where things are and can help her foster mom find her shoes. 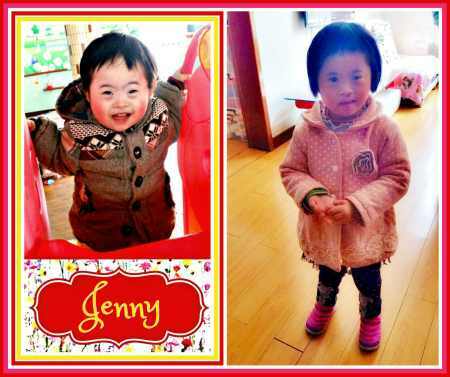 She has been described by orphanage staff as being introverted and attached to her foster mom. 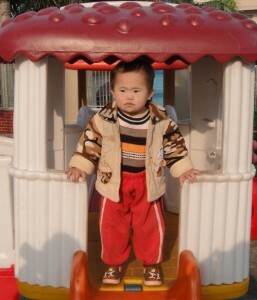 She enjoys playing by herself and watching other children play games, and she attends kindergarten. Davina came into care when she was about nine months old. She understands concepts like inner and outer, left and right. She can count to two and speaks in short sentences. She can eat with a spoon, wash her hands and dress herself. 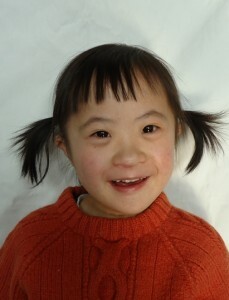 Davina is an energetic little girl who gets along well with others. Her favorite toys are balloons and toy cars. Sheena is the sweetest girl around! Agency staff have met her and said that she is very smart and pleasant. Sheena is also a favorite of her caretakers, giving her a lot of extra attention and love. She was sitting independently between 9-11 months of age and was crawling by one. 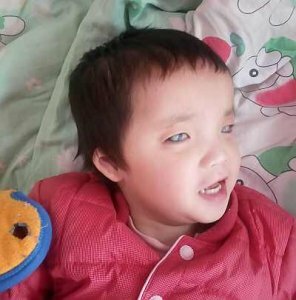 She started walking and speaking, though unclear, at age two. By three, she was a confident walker and could use a cup to drink. She’s a good eater and is not picky about food. Congee and meat are her favorites. She can go to toilet on her own and has few accidents. She does need a diaper at night. Sheena can also dress herself and put on her own shoes. When she was little, she got burned by hot water so she is still afraid of taking a bath. 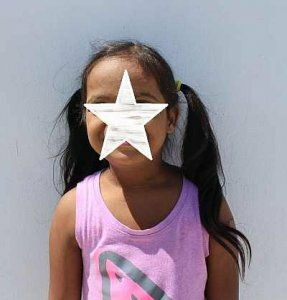 In January of 2016, Sheena started receiving schooling inside the orphanage. The teachers quickly learned that she liked the toy numbers. They taught her how to string the toy numbers. 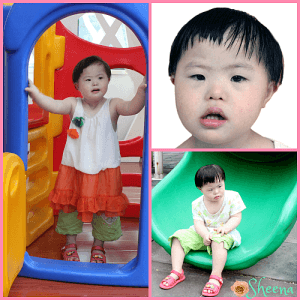 After three months, Sheena made big progress in her language, gross motor, and social skills. She has learned words like teacher, ayi, chair, mine, etc. When talking with her, she responds with sounds like “en, oh, hao”. She likes to listen to music and will follow the beat by clapping her hands. She also tries to sing to the music. Sheena can walk upstairs and downstairs by herself and can now run faster. When she sees other kids fall down, she will walk over to help the child get up. If other kids get hurt, she will go over and blow on it to soothe the pain. In September of 2016, Sheena showed good progress with her cognition. She focuses in class to learn with other kids. Sheena likes being active and being held. She enjoys imitating, playing with toy cars, and playing hide and seek. 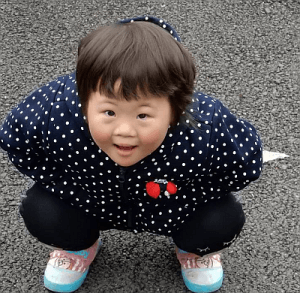 Emma is an adorable girl with Down syndrome. Emma is from a predominantly Christian state in Northeastern India that boarders with Myanmar. 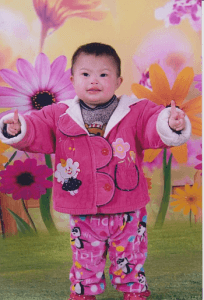 She is described as happy and enjoys playing with other children. UPDATE 2018: There are several other photos & videos available. Harlow desperately needs a family. 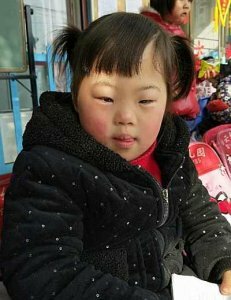 She really cannot wait years to be adopted without any medical care or better care at the orphanage to give her the stimulation she needs. Without this care, she will sink further and further to the point she may not be able to be reached. No personality. No personality. I kept reading it over and over again. No personality. This cannot be so. 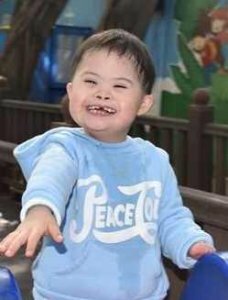 Her referral, from two years ago, describes her as “giggles when she is touched; lovely when she smiles; enjoys that someone accompanies and plays with her.” Now, no personality. I am fairly certain that it should not read ‘no personality,’ but instead should read ‘no spirit,’ or ‘lost spirit,’ or ‘crushed spirit.’ It is not her personality that is lacking, but her spirit slipping away. She has been given up on by those around her, and has no other option but to give up on herself. Harlow lives in dark, quiet solitude. No place for a child. She has lost hope. But we have not. We still see potential. We still see hope. And we will continue to share about Harlow until a family – HER family – sees it too. The agency that currently has Harlow’s file is also offering a $1500 grant. 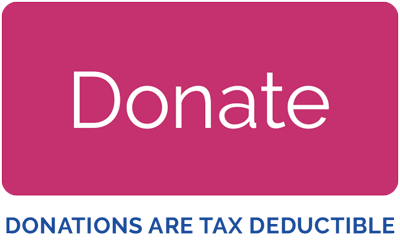 $5,822.15 has been donated towards the cost of my adoption! Lillie is 4.5 years old with a rosy complexion. She is described as active and bright with a ready smile. Lillie is very social and loves to play. 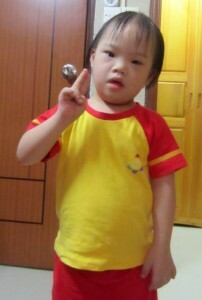 Her verbal skills are not very strong, but she can say “Dad” and “Mom” and some short phrases. She can understand simple things that adults say. 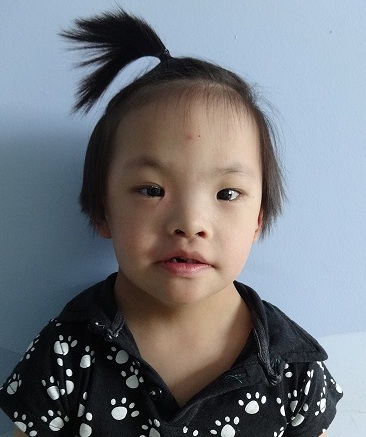 Shelby is a petite little girl who doesn’t let her small stature get in the way of helping others. It is reported that Shelby loves to help her peers by standing up for them when they are teased by bigger kids, or when they fall and get hurt. 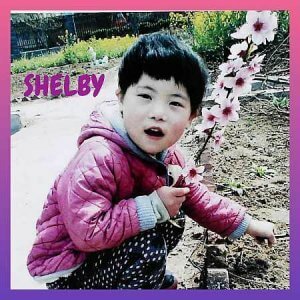 Shelby is an animated little girl who her orphanage workers describe as “lovely”. 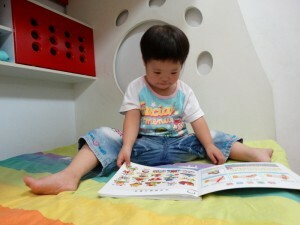 Shelby is a bundle of fun who loves imitating the behaviors of her peers such as reading books. 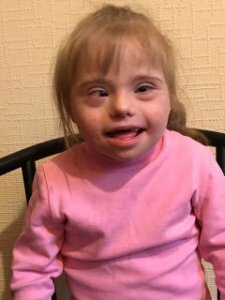 Daniella, 6, is described as an active and bright girl though her intellectual capabilities are behind that of her peers. She can use simple language, but cannot speak whole sentences. Her caretakers believe she has the intent to speak but is unable to do so clearly. Instead, Daniella often expresses herself through her actions. She enjoys listening to children’s songs and being read short stories. 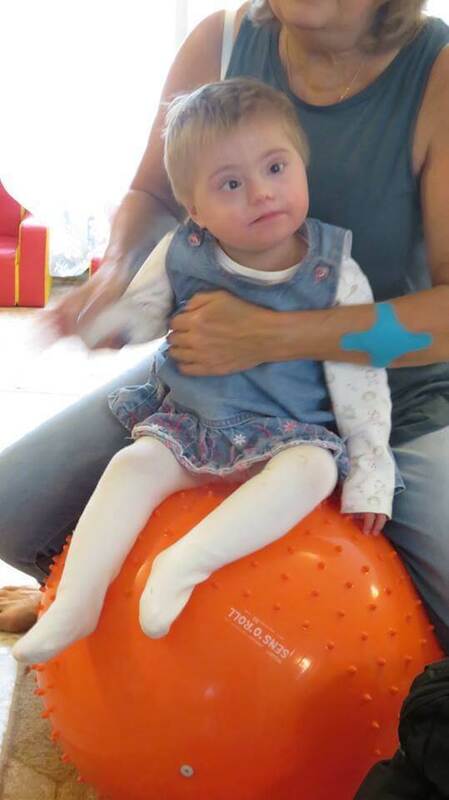 Daniella can run and enjoys body rhythm training where she is asked to do movements that imitate different animals. She can feed herself, put on her shoes, and clean up after herself. She is not potty-trained and must wear a diaper. Daniella gets along well with her caregivers and peers in the institute. She enjoys watching TV and playing house (i.e. cooking, cleaning). Daniella’s video. Hazel’s story is a little special. 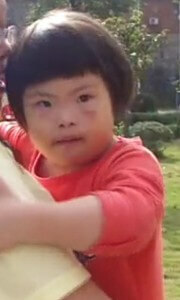 She is a beautiful 4 year old girl who has Down Syndrome. When one of the agency’s families traveled to adopt their son they visited the orphanage and met Hazel. They fell in love and asked if she had an adoption file. 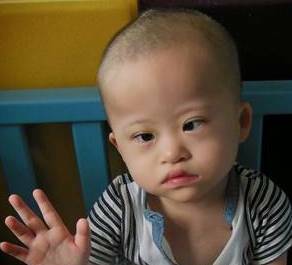 They were told she did not and they asked the orphanage personnel to please prepare the file. Apparently they listened, because when asked about her the last time the agency team was at the orphanage, they said her file was almost completed! Hazel is a funny little thing who loved the different activities we had going on in the room! She loved the balls and my goodness did she love the stacking cups! She kept trying to get them and take them to another part of the room! 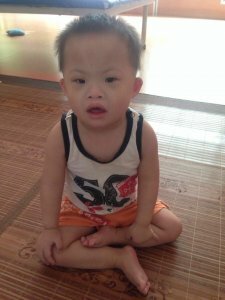 Hazel has a $4,000 grant through her current adoption agency! Hazel needs a family! Could she be your daughter? Additional information and photos can be found in this blog post. $1,600.40 has been donated towards the cost of my adoption! 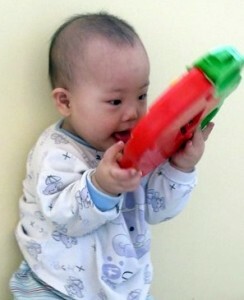 Emery is well adapted to her daily routine in the orphanage. She eats three meals a day but doesn’t have a big appetite and doesn’t care for snacks or desserts. 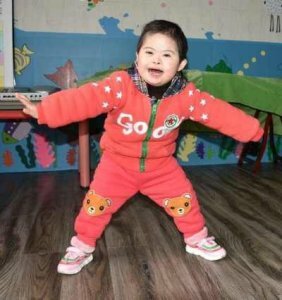 The orphanage staff make efforts to enrich her days to help her development by watching TV, listening to music, playing with toys and taking her out for outdoor activities. 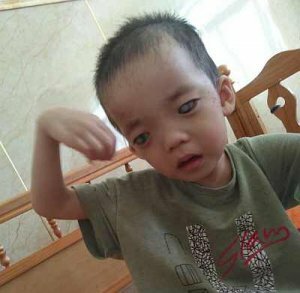 Her motion development is slightly delayed compared to other children but staff feel this is due to her being in orphanage life and not with a family. They say her opportunities are more limited there although she does participate in rehabilitation training in the institute. 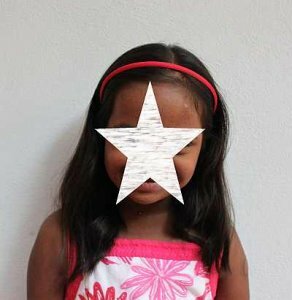 At the time of her report she was 3.5 years old and could sit independently, hold toys to play and walk holding the wall. She was described as being extroverted, well liked and having a ready smile. Emory could take off her socks and pants and was in good physical condition, but wasn’t yet speaking. 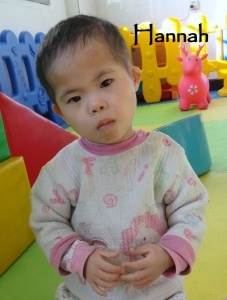 Orphanage staff hope she will be adopted by a family who can educate her and help her grow up to be a happy girl. Wrennie is gentle and quiet by nature. 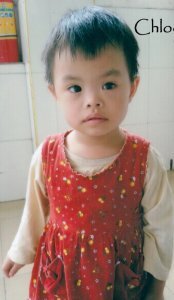 She is introverted but will also play with other children and will interact with her teachers and caregivers. She understands requests made to her and is usually compliant with her caregivers and teachers. 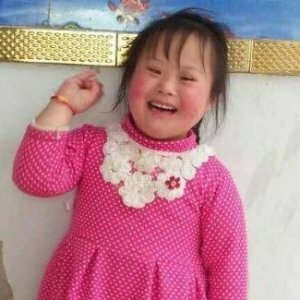 She enjoys music time and dancing with the other children. She also likes painting and drawing pictures. She will play with toys of her own choosing. Wrennie is in good physical condition and has no reported medical issues in general and her heart and respiratory system have been strong. 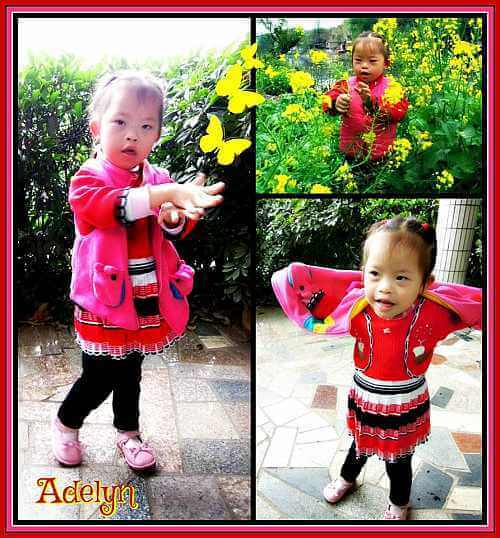 She is able to help take care of her daily needs and likes to imitate the actions of her teachers and caregivers. She is drawn to pretty things and adores wearing them as well. Cheyenne is an active and very optimistic 7 year old girl. She loves to sing and dance and is a very happy child. 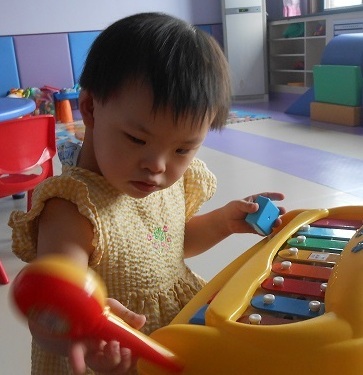 She loves playing piano and is capable of doing many things on her own, such playing and eating. She can communicate well, although sometimes must speak slower for strangers to understand her. She loves all types of food and is not a picky eater. She has been diagnosed with Down syndrome. 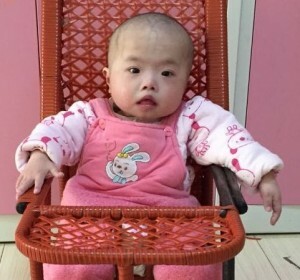 Could this precious girl be the joyful addition your family needs? This is Chloris! 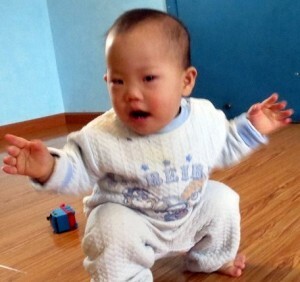 Chloris came to the orphanage when she was just a few months old. 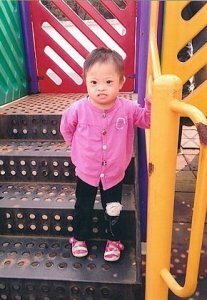 They found she has Down syndrome, with no known heart or other health issues. 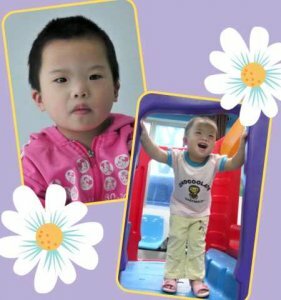 Chloris lives with a foster family, and gets along very well with her foster siblings. 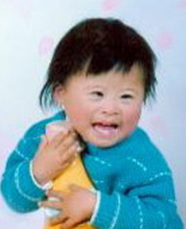 Her development has been delayed, as is typical for a child with Down syndrome. 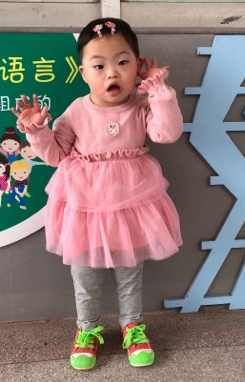 Chloris has some speech delays which will likely require some speech therapy. She is bright, happy, engaging, and very social! Her foster family has helped her in her development so much! Chloris enjoys playing with her foster sisters…a family for Chloris with built in playmates would be wonderful! $2,340.00 has been donated towards the cost of my adoption! 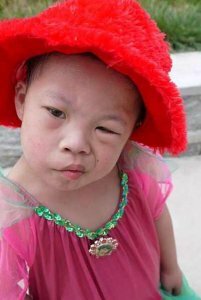 Hannahlee is a beautiful little girl who is 6 years old. 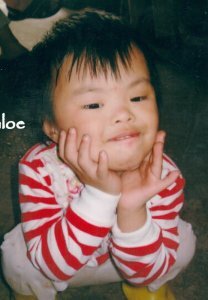 She came to the orphanage when she was about a month old, and was found to have Down syndrome. Hannahlee’s medical showed a heart murmur, but further tests showed no problems. 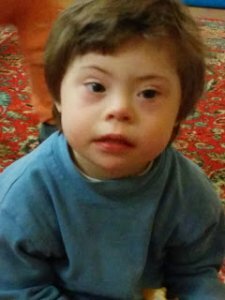 Hannah has the delays expected with a child who has Down syndrome. She is making progress, and her nannies work with her every day. Hannahlee is a thoughtful and sweet girl. Her overall health has been good. She enjoys playing in the play room, and likes stuffed animals. Hannahlee’s nannies all hope she can find a loving family. We do, too! $1,031.40 has been donated towards the cost of my adoption! 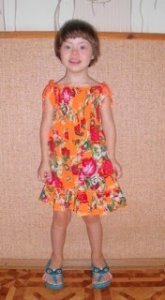 Everlynne is an adorable little girl who is 5 years old. She came into care when she was 18 months old. 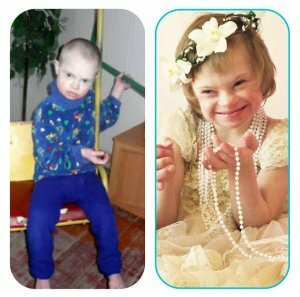 Everlynne has Down syndrome, with no known heart or other health issues. She is part of a foster family, and loves having a big sister to imitate! 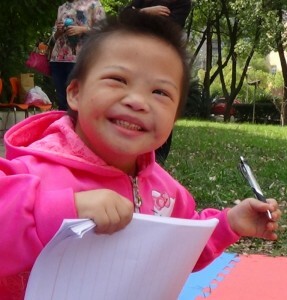 When her foster sister is doing her homework, Everlynne picks up a pen and wants to learn to write, too. Everlynne likes to sleep late (8am), and runs to check on the chickens in the coop every morning. She is a very helpful little girl. 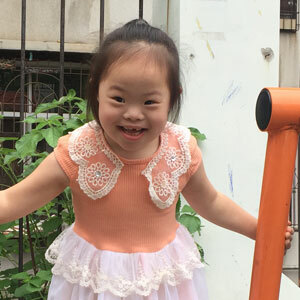 Everlynne loves to ride the tricycle, and especially loves to dance. She has a good imagination, and likes to take photos! 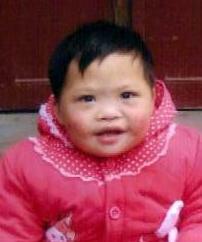 Everlynne gets along well with other children, and is very close to her foster mother. She has been part of a family, and is now ready to have a family of her own. $1,061.50 has been donated towards the cost of my adoption! Prepare to fall in love with 6-year-old Megan! 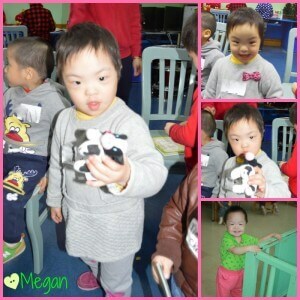 Megan is an adorable and social little girl. She is bold when meeting new people. If you have a toy in your hand, she will happily come your way! She loves to study the toys by twisting and turning them in her hands. Megan is very curious and loves to explore her surroundings. She is a very happy and smiley little lady. Megan’s caretakers adore her and they know she will thrive with a loving family of her own. 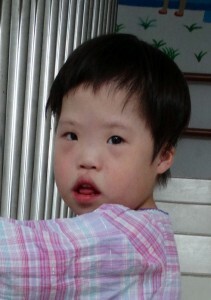 Orphanage staff say Eliza is very friendly and cheerful. She does not express herself well verbally but does know some words such as “mom” and “dad”. She tends to communicate in other ways such as patting her stomach to show she is full so the staff do not have trouble knowing what she needs. Eliza has good motor skills and is always very active. She loves getting to run and play hide and seek! She is also able feed herself and likes to color or draw. 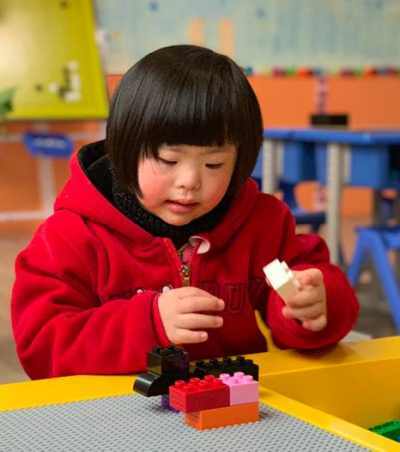 She enjoys getting to play with blocks and puzzles and she especially loves teddy bears. Everyone who works with Eliza agrees that she is a wonderful little girl! $18.96 has been donated towards the cost of my adoption! Rosalia seems to be doing very well! Her caretakers say she is a very helpful, adorable and happy little girl. 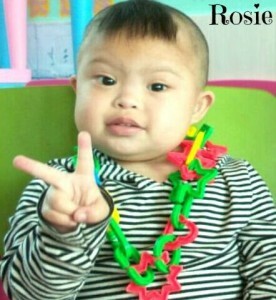 Rosie is a fast learner, smart and active. She loves her teachers and going to class. She likes to play with my friends and play with the ring toss, blocks and balls. 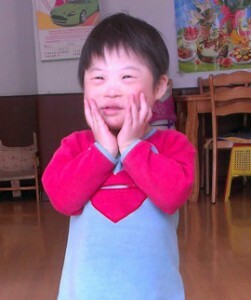 Temple is a precious little girl who is 3 years old. 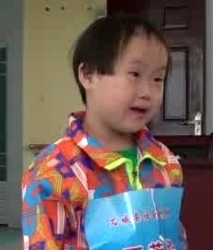 She has Down syndrome, with excellent gross and fine motor skills. 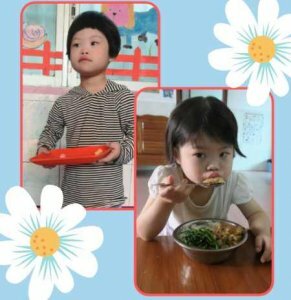 Temple is not a good eater, and they are working with her to improve her nutrition. In her file, there is a description that may well be a bad translation, but the agency loves it. Under “Personality”, it say Temple is “relentless”. Perhaps, strong-willed is what they meant. But a relentless, adorable little girl will do well in life, for sure! Temple is not fond of being awakened to eat, but is typically a very happy little one. She loves to be held and hugged, Temple is a delightful little girl who will bring such happiness to your family! $838.20 has been donated towards the cost of my adoption! 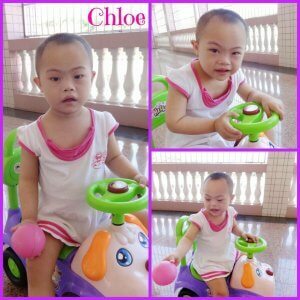 Little Chloe is diagnosed as having Down syndrome. Chloe can walk without help. With one hand held, she can go upstairs. She is cooperative when putting on clothes and knows how to play with blocks. Chloe can chew food well. She can understand the simple request of adults and can follow simple directions or requests. 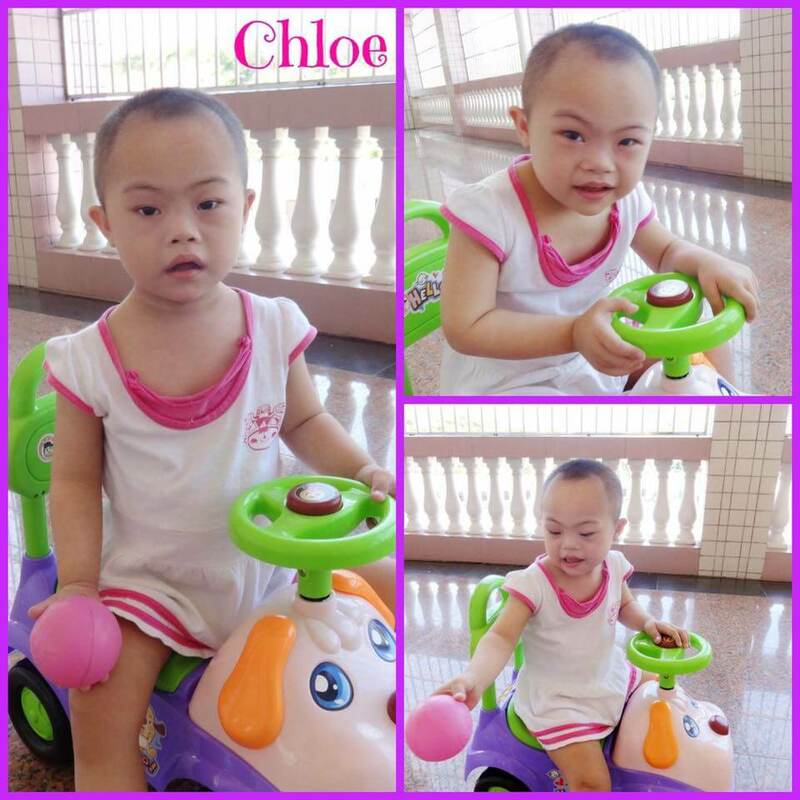 Chloe’s motor skills and intelligence development is delayed compared to other children her age. She can imitate adults to say simple words and actions. She makes good eye contact with her caregivers and visitors. Chloe can wave goodbye to people as well. We hope she’ll be waving hello to a very patient and loving family soon! $2,060.24 has been donated towards the cost of my adoption! Lillian loves being held so that she can pay close attention to everything that is going on around her. 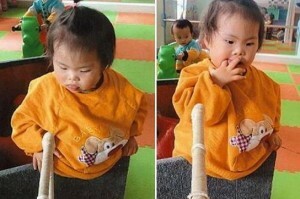 She does not walk or speak yet, but can kneel down and crawl around independently. Lillian also can make sounds when she needs something. She still has weak chewing and swallowing skills so eats mainly milk and rice paste. She can hold her own bottle. She loves to smile and to watch people talking.Lillian also likes to be teased and held by her caretakers. She is ready for a family of her own! $1,018.70 has been donated towards the cost of my adoption! Sweet Cara is 4 years old, and and absolutely adorable! 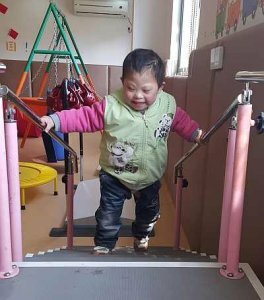 She came into care when she was about 10 months old, and was diagnosed with Down syndrome as well as several heart issues. She had surgery in 2012, and the surgery reports are in her file. 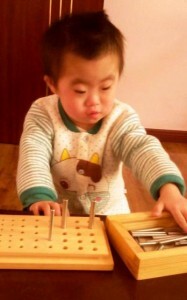 Cara’s motor skills are very good, and she is quite a helper for her teacher! She is very social, cheerful, and incredibly responsible for a young child. Cara has been living in a family setting, and is ready for the big move to a family of her very own. $646.50 has been donated towards the cost of my adoption! UPDATE November 2015, from her caregivers: Shaena is outgoing and lively, but sometimes stubborn. She gets along well with other children. She is very attached to her nannies. She still needs assistance with dressing and other care needs. She is not potty trained, still in a diaper. She sleeps very well, she’s a good eater, and she attends preschool. From an update 2/2015: Shaena can play well with blocks and she can dance to the music. She can avoid obstacles when pushing carts and she can reach things by standing on her tippy toes. Shaena gets a little aggressive with others when mad. She is healthy, strong, and in good health. She can understand some simple instructions like “give me the paper in your hand, do not climb, sit well, eat”, etc. Shaena can crawl down the bed very quickly and she can walk by herself for a while. She can stand up after falling over and can climb well. Shaena can hold small tiny things and can pull the rope by changing hands. Shaena can pick up and throw balls. She will ask to be held when adults walk by her and she knows if she is being criticizing or praised. When praised, she gets very happy! When you point out her mistakes, she will cry. Shaena’s favorite things to do are imitate, eat, and dance. $1,183.70 has been donated towards the cost of my adoption! Dimples! I just love babies who have dimples! 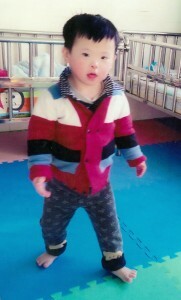 Kerry was born in May 2012 and is doing wonderful. She is beginning to walk and loves cookies. 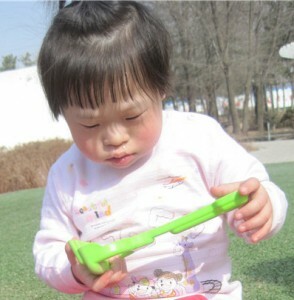 Kerry loves music, being outside and playing games. The agency has a video available. $1,139.90 has been donated towards the cost of my adoption! Georgia is a quiet little girl who loves to be held. She is in good spirits and has a good appetite. She can grasp for toys, turn her body over and raise her head. Although she is delayed developmentally she is a very happy little girl. $707.56 has been donated towards the cost of my adoption! Lucina came into care when she was 2 years old. She is doing very well! Lucina has Down syndrome with good motor skills. She is able to imitate words, but her speech is not very clear. Lucina had rickets, and they have improved her diet to help this. Lucina loves to slide, and is very serious about riding the rocking horse. 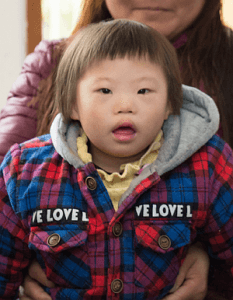 She is a favorite of the other kids in the orphanage, and she loves them all, too. 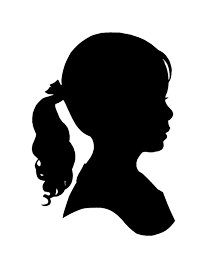 Lucina needs to be able to let her hair grow…a rocking horse…hugs…but most of all, she needs a family! Update: Lucina’s motor skills are good and her speech is coming along. She can scribble with crayons and wash her face. She sings along with her teacher. Lucina is toilet trained (using her country’s traditional toilet) but wears a diaper at night just in case. 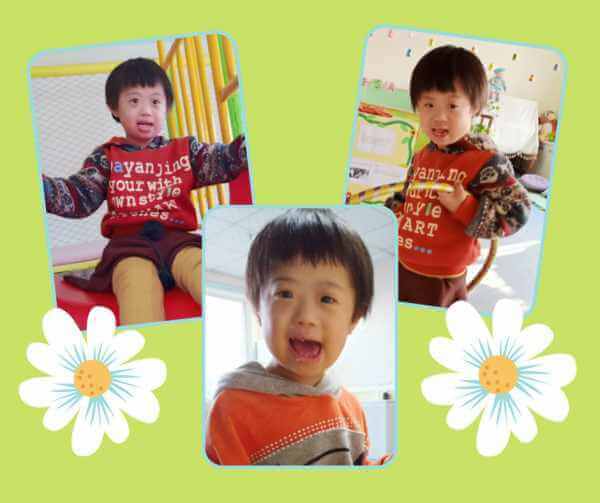 Lucina loves to play with the other kids and loves for her teacher to give her hugs! $1,109.20 has been donated towards the cost of my adoption! Xina is a very well-behaved little girl. Her skin is fair and she is chubby. She has become extremely adorable. Little Xina is one and a half years old this year. 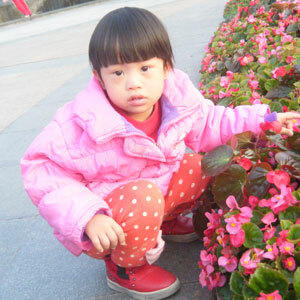 Because she has Down syndrome, Xina’s physical development is slightly behind other children the same age. Now, Little Xina can crawl and turn her body over and roll. She is able to understand what adults say. If you call her name or clap your hands, she will look at you and she is able to quickly crawl to you. Xina likes rag dolls. She is very clever. 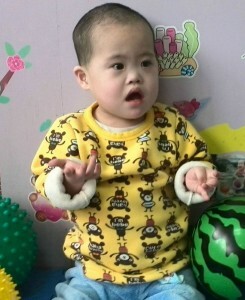 Xina still cannot talk, but if you talk to her, she will babble responses to you. Xina is an extremely pretty and adorable child. We really hope Xina will find her forever family! $432.00 has been donated towards the cost of my adoption! Savannah likes to look at the colorful pictures and colorful toys. 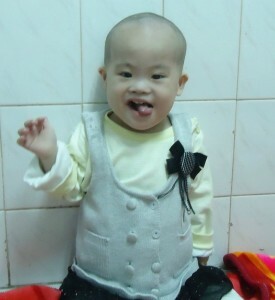 She has good living habit, normal diet, good appetite, regular defecation and urination, and normal sleep. Savannah is lovely, and close to her caregiver. Savannah can sit for a while, and can understand what nurturer says. She likes music, eating and plush toys. Agency staff met and interacted with Savannah in September! She is a sweetheart! $1,429.90 has been donated towards the cost of my adoption!